(Manama) – Bahrain Airport Services Company (BAS) has participated in the Higher Education and Training Exhibition in Oman. This participation in the Omani exhibition last week was in line with the company’s strategy of focusing on developing human resources in association with local and international training institutions inside and outside the Kingdom of Bahrain to attract students and trainees, and replace them to the labour market and opportunities in the logistics and aviation sectors. The exhibition was held with the support of the Ministry of Higher Education, Ministry of Education, National Center for Vocational Guidance and the Oman Academic Accreditation Authority. 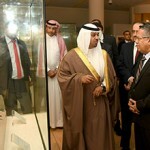 More than 3,000 visitors attended it in three days. Where the visitors learned about the most important training courses and the learning mechanism at BAS, which has more than 40 years of experience in airport management and has diverse international expertise. BAS offers a number of commercial activities including: aircraft and passenger handling services, catering services, aircraft engineering services, the BAS Engineering Training Center (BAETC), as well as owning and managing airport lounges. Established in 1977, Bahrain Airport Services Company (BAS) has a long track record of 40 years of continuous bidding and is the only operator of ground services at Bahrain International Airport since its establishment. A trusted name in the world of services as a company certified by the Air Transport Safety Audit Program of the International Air Transport Association.